Circulates cooled water to cool the engine. Transmits engine power output to transmission. Used at engine ignition. 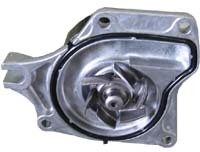 Located at the center of various gears of automatic transmission. Conveys shift lever's movement to main shaft. Used for clutch to be pedaled at gear shifting. Transmits power from differential to tires. Reduced weight hollow shaft used for MT or 4WD transfer.